Hi Jay, I see someone else has the same issue. My guess is a lot of people have this issue but it's not been attributed to KUTools as the only way to know this is to use Excel without KUTools and most of us will never do that. Have you got a fix yet please? The issue is really serious and makes using KUTools impossible with multiple sheets open, not good as your software is aimed at power users that are likely to have more than one sheet open. I have exactly this same problem. I thought it might be a memory problem or something. I recently got a brand new computer and clean installed everything, and I still have this issue. It is a huge efficiency issue. Every workbook has to be constantly max/min'd to get the worksheets usable. I need a fix. (I have attempted to disable everything else, and it doesn't make a difference.) If I disable KuTools, the problem goes away. I'm also using Office 365, 64-bit, Kutools 18. And go to reinstall the software. This issue is hard to describe but it'd only an issue with KUTools installed. If I uninstall the KUtools addin Excel works fine. I am on Office 365 Excel and the latest update of Windows 10 and KUTools. With one spreadsheet open all is OK. This issue occurs when a second sheet (not workbook) is opened. 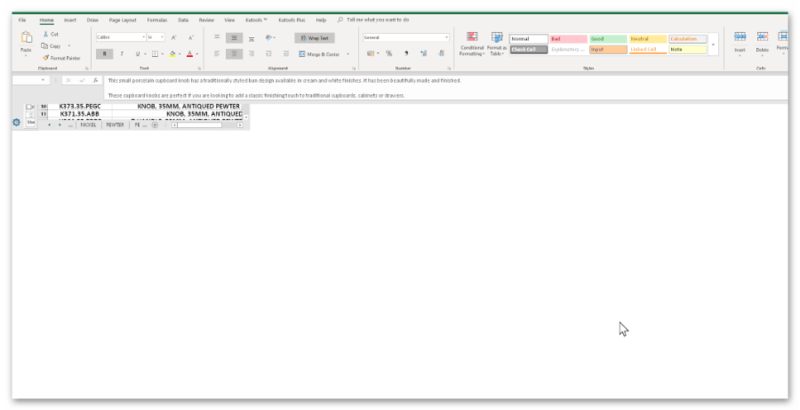 If you look at the screenshots you'll see the data window has moved up into the top left of the Excel window with the top of the sheet hidden behind the menu bar. It's impossible to get this back so the only way I have found is to maximise the window or change it's size. This makes using the spreadsheet impossible. I am on hi res screens, one is 4K (3840x2160) and the other is 2560x1440. I really need a fix for this as it makes Excel unusable with 2 sheets open.